I am very proud and greatly delighted that STC NICCA (formerly known as SIAM TEXTILE CHEMICAL CO., LTD.) has been a great part of our customers’ success for more than three decades of its establishment. With the company’s strong foundation, we have gone through many economic challenges and crises, and yet have stood alongside Thai industries until now. 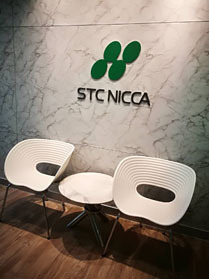 Since May 2009, the company has changed its name from SIAM TEXTILE CHEMICAL CO., LTD. to STC NICCA CO., LTD. to reflect the unity with our parent company, NICCA CHEMICAL CO., LTD. in Japan. Besides serving our core customers in textile industry, we aim to expand our business domestically and internationally by many forms, for example, exploring new opportunities in automotive and paper industries. As a subsidiary, we have adopted policies of NICCA CHEMICAL to collaborate with other subsidiaries of NICCA group of companies, especially in the South East Asian region, in order to achieve higher efficiency in production and product delivery to our customers. Finally, I would like to express my sincere gratitude all STC NICCA members, who play essential role throughout our 40 years of operations and are key success drivers to the company’s future. Also, I am much appreciative of various supports from NICCA CHEMICAL. Lastly, I would like to show my deepest gratitude to our valued customers for your trust in our products. I would like to ensure all of you that we will keep improving our products to best serve your needs.